Rahulkumar Agrawal, PRIYANKA SHAH and . "Design and Simulation of Multilayer Microstrip to Stripline transition on LTCC for 20GHz frequency range application." International Journal for Scientific Research and Development [Conference 10 : NCACSET 2017] (2017): 1-3. Anand Mehta, Anand Mehta and Manish Abhishek. "An Approach for Security Information and Event Management with Hadoop MapReduce." International Journal for Scientific Research and Development [Conference 10 : NCACSET 2017] (2017): 4-7. Sejal Sirsikar and Hiren R. Patel. "Improvement in Resource Optimization of Composite SaaS using Genetic Algorithm." International Journal for Scientific Research and Development [Conference 10 : NCACSET 2017] (2017): 8-10. Shailja Maniya. "A Survey of Identification of Plant Disease Using Image Processing Techniques and Chameleon Clustering Method." International Journal for Scientific Research and Development [Conference 10 : NCACSET 2017] (2017): 11-14. ANKITKUMAR MISHRA, ADARSH PARIKH and . "CROP HEALTH MONITORING INFORMATICS SYSTEM BASED ON IOT." International Journal for Scientific Research and Development [Conference 10 : NCACSET 2017] (2017): 15-20. PRANJAL BHATT. "NEXT GENRATION DATA STORAGE (DNA) BHATT." International Journal for Scientific Research and Development [Conference 10 : NCACSET 2017] (2017): 21-25. Kamal Galdhariya, Khushali Raval and Shardul Agravat. "A Novel Approach to Recognize Handwritten Gujarati Digits." International Journal for Scientific Research and Development [Conference 10 : NCACSET 2017] (2017): 26-29. Reena Aparnathi, Dr.Vandana Rohokale and . "THREAT DETECTION BY DEPLOYING DARKNET." International Journal for Scientific Research and Development [Conference 10 : NCACSET 2017] (2017): 30-33. MONIKA MARU, MEHUL PARIKH and . "Blur Estimation and Identification of Degraded Images." International Journal for Scientific Research and Development [Conference 10 : NCACSET 2017] (2017): 34-38. Pooja Bavarva, Yash Punjabi and Rushabh Raolji. "SECURITY ISSUES ASSOCIATED WITH BIG DATA IN CLOUD COMPUTING." International Journal for Scientific Research and Development [Conference 10 : NCACSET 2017] (2017): 39-45. Maulik Bhensdadia, Aditya Kumar Sinha and Gardas Naresh Kumar. "Intrusion Detection and Prevention in Internet of Things." International Journal for Scientific Research and Development [Conference 10 : NCACSET 2017] (2017): 46-50. Bhargav Rathod, Dr. Vandana Rohokale and Mr.Naresh Gardas . "Security Mechanism for Home Area Network (HAN) in Smart Grid." International Journal for Scientific Research and Development [Conference 10 : NCACSET 2017] (2017): 51-58. Shrinidhikumari Chaudhari, Chirag Thaker and Bhavesh Borisaniya. "An Optimized Task Scheduling Algorithm in Cloud Computing ." International Journal for Scientific Research and Development [Conference 10 : NCACSET 2017] (2017): 59-63. BANSHRI MODHIYA, Dr.chirag Thakur and Dr.Bhavesh Barisaniya. "Data Storage Security Model using Homomorphic Encryption." International Journal for Scientific Research and Development [Conference 10 : NCACSET 2017] (2017): 64-67. Shital Sharma, Dr, Chirag Thaker and . "Execution Time Enhancement Through Efficient Task Scheduling Algorithm in Cloud Computing Environment." International Journal for Scientific Research and Development [Conference 10 : NCACSET 2017] (2017): 68-72. Kishan Chudasama, Girish Khilari and . "Test Harness for Web Application Attacks." International Journal for Scientific Research and Development [Conference 10 : NCACSET 2017] (2017): 73-77. Satvik Khara, Umang Thakkar and . "Enhancing Selection of Load Balancing Algorithms Dynamically in Cloud Computing." International Journal for Scientific Research and Development [Conference 10 : NCACSET 2017] (2017): 78-82. Niharika Dhandhukiya, Niharika Dhandhukiya Niharika Dhandhukiya and Aradhna Deshmukh. "CLOUD COMPUTING: OPPORTUNITIES IN E-GOVERNANCE PARADIGM." International Journal for Scientific Research and Development [Conference 10 : NCACSET 2017] (2017): 83-86. Pooja Parmar, Pooja Parmar and Tushar Champaneria. "Comparative Study of Different Data Formats for IoT." International Journal for Scientific Research and Development [Conference 10 : NCACSET 2017] (2017): 87-89. SUMIT SHUKLA, TUSHAR CHAMPANERIA and . "Survey of Various Filtering Methods for Sensor Data." International Journal for Scientific Research and Development [Conference 10 : NCACSET 2017] (2017): 90-92. Hiral Patel, Hiral Patel and Shital Solanki. "Serendipitous Bookmark Recommendations in a Social Bookmarking System using Behavioral Data Mining." International Journal for Scientific Research and Development [Conference 10 : NCACSET 2017] (2017): 93-96. NIMESHKUMAR PATEL, Sanjay Shah and . "Semantic Web based Information Extraction." International Journal for Scientific Research and Development [Conference 10 : NCACSET 2017] (2017): 97-101. HEMANG VAIDYA, Manan Shah and . "A Survey on Tools & Techniques for the Implementation of Ion-Exchange Chromatography." International Journal for Scientific Research and Development [Conference 10 : NCACSET 2017] (2017): 102-106. Rajeshkumar Pradhan, Rajeshkumar Pradhan and Sanjay Shah. "A Novel Approach for solving Matrix Chain Product." International Journal for Scientific Research and Development [Conference 10 : NCACSET 2017] (2017): 107-111. SOHESH DOSHI, Meet Gadhiya and SANKET SUTHAR. "Notorious ways of exploitation search engine." International Journal for Scientific Research and Development [Conference 10 : NCACSET 2017] (2017): 112-116. BHAVIN FATANIYA, BHAVIN FATANIYA and CHIRAG RAVAT. "Survey On Route Optimization for Mobile IP." International Journal for Scientific Research and Development [Conference 10 : NCACSET 2017] (2017): 117-124. Rashi Desai and Rashi Desai. "Google Material Design - The User Interface Development Notion." International Journal for Scientific Research and Development [Conference 10 : NCACSET 2017] (2017): 125-127. Pratik Panchal, Pratik Panchal and Usha Neelkantan. "Performance of different equalizers in MIMO - VLC." International Journal for Scientific Research and Development [Conference 10 : NCACSET 2017] (2017): 128-132. Bhumita Panara and Arpan Patel. "GLIMPSE ON VARIOUS KINDS OF SECURITY THREATS." International Journal for Scientific Research and Development [Conference 10 : NCACSET 2017] (2017): 133-135.
sumit trivedi, arun nandurbarkar and . "Offline Handwritten Character Recognition for Gujarati Language." International Journal for Scientific Research and Development [Conference 10 : NCACSET 2017] (2017): 136-139. Dhruvisha Patel, Dhruvisha Patel and Arun Nandurbarkar. "Content Based Image Retrieval for Diagnosis of Brain Tumor." International Journal for Scientific Research and Development [Conference 10 : NCACSET 2017] (2017): 140-144. Dhruvi Prajapati, Dhruvi Prajapati and Usha Neelkantan. "Design of Frequency Multiplier at 120 GHz for Sub-Millimeter Wave LO Development." International Journal for Scientific Research and Development [Conference 10 : NCACSET 2017] (2017): 145-149. Pooja Patel, Pooja Patel and Dhaval Parikh. "A Survey on Characteristic Performance on DTNs Protocols." International Journal for Scientific Research and Development [Conference 10 : NCACSET 2017] (2017): 150-154. Bhavisha Shah, Aditya kumar Sinha and Vineeta Tiwari. "Maintain CIA of internal network in IoT ." International Journal for Scientific Research and Development [Conference 10 : NCACSET 2017] (2017): 155-159. Nausha Kotia, Prashant Karandikar and . "UVM Based Verification Environment for Performance Evaluation of DDR4 SDRAM using Memory Controller." International Journal for Scientific Research and Development [Conference 10 : NCACSET 2017] (2017): 160-165. Bhumita Panara, Arpan Patel and . "BASICS OF AES ALONG WITH NEWLY DERIVED ENCRYPTION LOGICS." International Journal for Scientific Research and Development [Conference 10 : NCACSET 2017] (2017): 166-170. Jay Raval, Ravi Raval and . "An Effective Way to Handle Failover in Client-Server Architecture." International Journal for Scientific Research and Development [Conference 10 : NCACSET 2017] (2017): 171-175. Viraj Mavani, Ayesha Gurnani and Jhanvi Shah. "A Novel Approach for Image Segmentation based on Histograms computed from Hue-data." 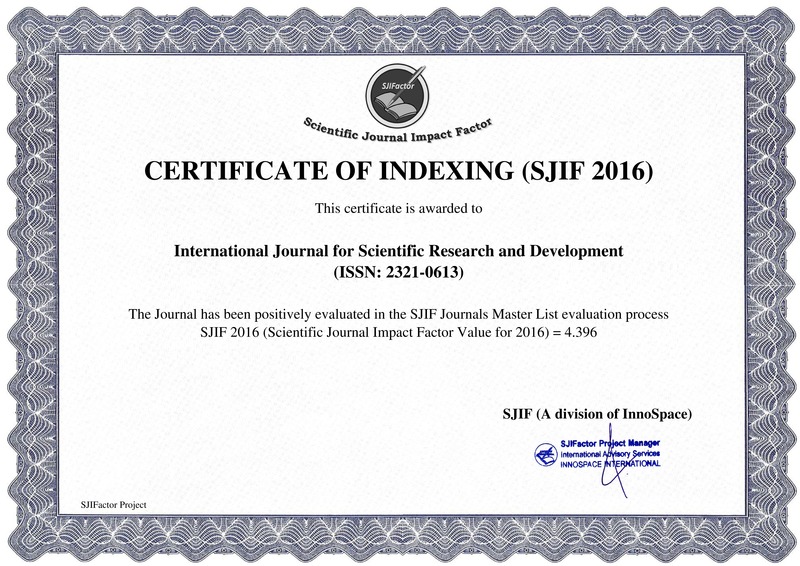 International Journal for Scientific Research and Development [Conference 10 : NCACSET 2017] (2017): 176-179. HIRAL MODI, MEHUL PARIKH and . "A Hybrid approach for Optical Character Verification ." International Journal for Scientific Research and Development [Conference 10 : NCACSET 2017] (2017): 180-184. Yash Khandhediya, Karishma Sav and Vandit Gajjar. "Human Detection for Night Surveillance using Adaptive Background Subtracted Image." International Journal for Scientific Research and Development [Conference 10 : NCACSET 2017] (2017): 185-189. Nikhil Chauhan, NIKHIL CHAUHAN and KIRAN PARMAR. "Performance Evaluation of Massive MIMO in terms of capacity ." International Journal for Scientific Research and Development [Conference 10 : NCACSET 2017] (2017): 190-194. Dhaval Patel, Vandana Rohokale and . "INSIDER ATTACK MITIGATION TECHNIQUE USING HYBRID SECURITY FRAMEWORK ON VANETS." International Journal for Scientific Research and Development [Conference 10 : NCACSET 2017] (2017): 195-199. Khalid Osman and Adarsh Parikh. "Design of Automatic Pipette Controller." International Journal for Scientific Research and Development [Conference 10 : NCACSET 2017] (2017): 200-204. Chintan Agravat. "A Survey of Different Enhancements in Weighted PageRank Algorithm." International Journal for Scientific Research and Development [Conference 10 : NCACSET 2017] (2017): 205-208. VANDIT GAJJAR. "REAL TIME COLOR SEGMENTATION AND COLOR FILTERATION." International Journal for Scientific Research and Development [Conference 10 : NCACSET 2017] (2017): 209-211. HETALBEN GEVARIYA, DHAVAL PARIKH and . "Trust-Based Secure On-Demand Multipath Routing Scheme In MANET." International Journal for Scientific Research and Development [Conference 10 : NCACSET 2017] (2017): 212-219. SAGAR KAVAIYA, Prof.Usha Neelakantan and . "Window Function Analysis for Multi Carrier Transmission." International Journal for Scientific Research and Development [Conference 10 : NCACSET 2017] (2017): 220-224.